Some of you don’t feel the latex love. You crazy kids! Luckily, Jake has some glossy Superfine jeans so you can have shine without the cling … if you’re willing to pay the price. Expensive jeans, eh? Here’s a pair that’s on sale. 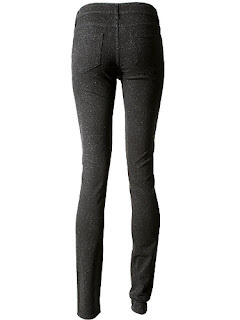 Liberty Jean by Superfine in Glitter. $90, reduced from $300. 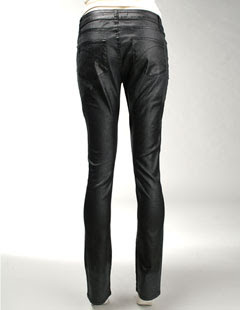 The site also has my favorite jean style, the Hex by Acne. The Opal wash is on sale for $190, down from $295. UPDATED TO ADD: Well, what a coincidence. After I posted this, I dropped in on the lovely Jennine at The Coveted to find her in head-to-toe shiny. Here’s her photo to inspire you. One more shiny style for you. 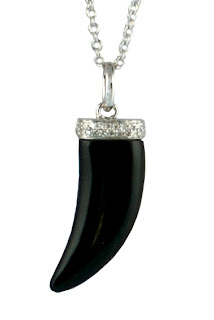 This is not my own design but I got my hands on this supercute black onyx and diamond horn. It’s on a 16″ long chain in 14K white gold and I’m selling it for the low, low price of $225. Cheaper than Superfine jeans! You’ll get a lot of joy out of this for a long time. Trust. If you’re interested, email me at wbjewelry (at) gmail dot com. 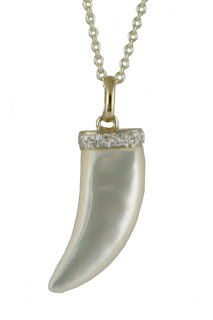 It also comes in mother-of-pearl. Cuteness! Don’t forget that I have other pieces on sale! Click here for pictures. Go Ahead. Be a Big Girl's Blouse. I love the shark tooth necklaces! 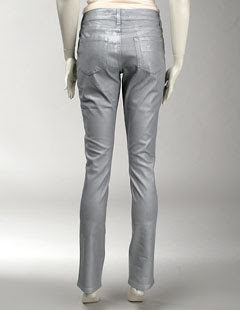 I just got my first pair of Acnes (Hep, Lavender) and they are indeed some of the best jeans I’ve bought in awhile. . . I am now completely sold on the brand. Oh, I LOVE the lavender wash! The Hep style doesn’t work for me though. I strongly urge you to wash the jeans as infrequently as possible (my general policy re jeans) and hand wash them to avoid shrinkage! I’m so cautious about not washing my jeans. . .I shall decline to share how often I opt not to do it (it’s a little gross). Oh and that Marc Jacobs post. . . I actually have a real story about a designer who decided to nag me after a blog post I wrote about her sheisty service and bad business. I’ll elaborate in the future. . . but let me tell you, I was so surprised and couldn’t stop laughing. Somebody should spend less time googling herself and more time workin’ on the old customer service skills. Love the black shark tooth necklace. Have you seen these leggings? I can’t get your link to work, Susanna,but I’m going to guess that it’s for the Alice & Olivia sequin leggings. Nice! I might add those to this post.